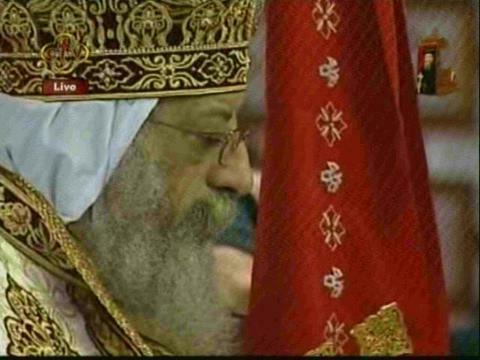 CAIRO: Pope Tawadros II has been enthroned as the new leader of Egypt's Coptic Christian minority in a ceremony at Cairo's St Mark's Cathedral attended by Prime Minister Hisham Qandil. Dozens of Coptic clerics in flowing robes took part in Sunday's ceremony, the first in four decades, as the Muslim Prime Minister looked on. Arabic, English and Greek mingled with the ancient Coptic language of the church's liturgy in the psalms and prayers of the service and the tributes of well-wishers. Tawadros, 60, was chosen on November 4 to succeed Pope Shenuda III, who died in March after four decades on the patriarchal throne. He was chosen after a blindfolded altar boy picked his name from a chalice, according to church custom. He becomes spiritual head of the largest Christian minority in the Middle East and 118th pope in a line dating back to the origins of Christianity and to Saint Mark, the apostle and author of one of the four Gospels, who brought the new faith to Egypt. Shenuda, a careful, pragmatic leader, died at a critical time for the increasingly beleaguered minority, which has faced a surge in sectarian attacks after an uprising overthrew president Hosni Mubarak in February last year. The pope leads the Coptic Orthodox community in a country where Christians make up between 6 and 10 per cent of an 83 million population. Amid increased fears about the community's future after the overthrow of Mubarak, Tawadros will be its main contact with Islamist President Mohamed Morsi. The rise of Islamists after the revolution sparked fears among Copts of further persecution, despite Morsi's repeated promises to be a president "for all Egyptians". Copts have suffered sectarian attacks for years, but since Mubarak's overthrow several dozen have been killed in sectarian clashes and during a protest in October last year crushed by the then ruling military.